Watt's Up? : How can I measure output impedance of a DC power supply? How can I measure output impedance of a DC power supply? In my last posting “DC power supply output impedance characteristics”, I explained what the output impedance characteristics of a DC power supply were like for both its constant voltage (CV) and constant current (CC) modes of operation. I also shared an example of what power supply output impedance is useful for. But how does one go about measuring the output impedance of a DC power supply over frequency, if and when needed? There are a number of different approaches that can be taken, but these days perhaps the most practical is to use a good network analyzer that will operate at low frequencies, ranging from 10 Hz up to 1 MHz, or greater, depending on your needs. Even when using a network analyzer as your starting point there are still quite a few different variations that can be taken. Measuring the output impedance requires injecting a disturbance at the particular frequency the network analyzer is measuring at. This signal is furnished by the network analyzer but virtually always needs some amount of transformation to be useful. Measuring the output impedance of a voltage source favors driving a current signal disturbance into the output. Conversely, measuring the output impedance of a current source favors driving a voltage signal disturbance into the output. The two set up examples later on here use two different methods for injecting the disturbance. The output voltage and current signals need to be compatible with the measurement inputs on the network analyzer. This means a voltage divider probe may be needed for the voltage measurement, depending on the voltage level, and a resistor or current probe will be needed to convert the current into an appropriate voltage signal. A key consideration here is appropriate scaling constants need to be factored in, based on the gain or attenuation of the voltage and current probes being used, so that the impedance reading is correct. 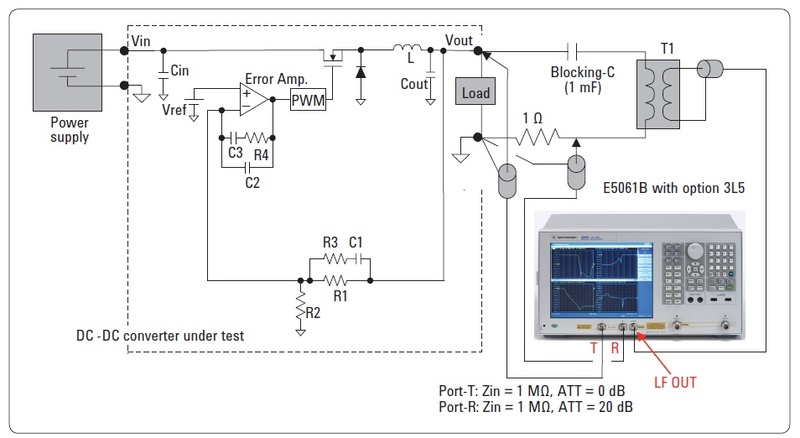 One example set up using the Agilent E5061B network analyzer is shown in Figure 1, taken from page 15 of an Agilent E5061B application note on testing DC-DC converters, referenced below. Here the disturbance is injected in through an isolation transformer coupled across the power supply output through a DC blocking capacitor and a 1 ohm resistor. The 1 ohm resistor is doing double duty in that it is changing the voltage disturbance into a current disturbance and it is also providing a means for the “R” input to measure the current. The “T” input then directly measures the DC/DC converter’s (or power supply’s) output voltage. 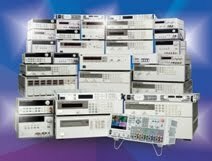 A second, somewhat more elaborate, variation of this arrangement, based on using a 4395A network analyzer (now discontinued) has been posted by a colleague here on our Agilent Power Supply forum: “Output Impedance Measurement on Agilent Power Supplies”. In this set up the disturbance signal from the network analyzer is instead fed into the analog input of an Agilent N3306A electronic load. The N3306A in turn creates the current disturbance on the output of the DC power supply under test as well as provide any desired DC loading on the power supply’s output. The N3306A can be used to further boost the level of disturbance if needed. Finally, an N278xB active current probe and matching N2779A probe amplifier are used to easily measure the current signal. Hopefully this will get you on your way if the need for making power supply output impedance ever arises! What is Command Processing Time?